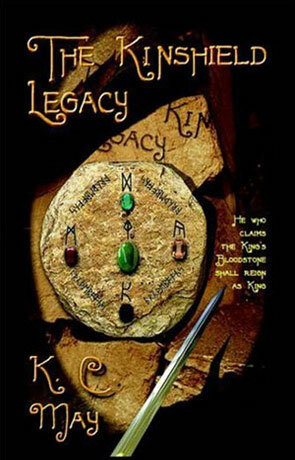 The Kinshield Legacy is a fantasy novel by KC May. For two hundred years a mysterious stone tablet embedded with five magical gems has sat abandoned in a cave, while the kindom around it falls to ruins. But then, the gems in the tablet, one by one, disappear and the next King of the realm may finally be chosen. Warrant knight Gavin Kinshield is that man and unless he can find a replacement, it will be up to him to rule the kingdom. All he really wants is the letter written by his ancestor Ronor Kinshield, champion to King Arek, confessing the truth of how the king perished. Meanwhile there a number of people trying to track down this future king, each with their own agenda. Daia Saberheart, warrior of the Viragon Sisterhood, wants to find the future king and help him claim his rightful place. Blacksmith Risan Stronghammer wants to reward him with a powerful weapon. And the sorcerer Brodas Ravenkind wants to capture him, steal his secret and claim the throne for himself. But when Gavin finally tracks down Ronor's letter, he gets far more than he's bargained for, for the truth of King Arek's demise is far darker than he ever imagined. The Kinshield Legacy is a high fantasy romp that captures the attention right from the very first paragraph and doesn't let go till the very end. There's a really nice familiar feeling to the novel that makes you immediately feel comfortable and at home reading the story. This style seems brought about by the excellent wordplay and quality of the prose. It's difficult to believe that this could possible be KC May's first novel, if I didn't know I would have said she had been writing for years. The characters are rich and vibrant while the intricately crafted plot is set at just the right pace. The nicely underplayed fantastical elements are seamlessly blended into the story so that everything feels natural and there is nothing to jar or disrail the story. It's a remarkably immersive experience telling the tale of a humble knight who is just trying to do the right thing for his Kingdom and find the rightful heir. You could argue that the characters are fairly black and white, good and evil but to me this was just a part of the high fantasy style, it's a tale that should appeal to all ages. The Kinshield Legacy is a beautifully crafted fantasy work that works so well, perfect escapism and highly recommended. Written on 8th December 2010 by Ant.